Thanks to the measures taken to develop viticulture, one of the oldest and traditional spheres of the Azerbaijani economy, growing more productive grape varieties and improving the quality of wine production, the winemaking sector has entered a new phase of development. The viticulture and wine-making complex of Shirvan Wines LLC in Shamakhi district, which opened with the participation of Azerbaijani President Ilham Aliyev on August 25, aims to bring back the former glory to this sphere, to contribute to the development of wine-making tourism and to take its rightful place in foreign markets. For the first time in Azerbaijan, there are plans to annually produce 1.4 million liters of wine (1.866 million bottles) at a plant specializing in the production of organic wine by using advanced technologies at all stages - from planting grape seedlings to supplying the consumer with ready-made wine. The plant carries out intensive work on ISO 22000 certification of wine recognized by the EU as organic one. The natural climatic conditions of the Meysari village of Azerbaijan’s Shamakhi district, the volume of annual precipitation, temperature indicators, as well as the results of analyzes of soil samples taken from various places of the territory and carried out in various laboratories in France, confirm that there is an opportunity to grow high-quality and productive types of grapes. At the stages of selection, planting, rendering agrotechnical care to the seedlings according to local conditions, the collection and processing of grapes, regular consultations are held with experts specializing in the viticulture sphere of France. All these are factors that cause the production of high-quality winemaking products that are easily competing in the markets. 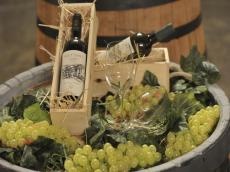 The results of tests on the quality and safety of samples of white dry wine “Sadaf”, red dry wines “Marjan” and “Makhmari Premium” of the Meysari brand, carried out in the test laboratory of the Food Safety Institute of the Azerbaijan Food Safety Agency, confirmed their compliance with the requirements of world and Azerbaijan standards. When conducting the tests, the Agency’s laboratory used certified material from the French company BIPEA, and all results were confirmed according to this standard. The work carried out on the application of modern technologies in the field of organic wine production, compliance of product quality and safety indicators with the requirements of local and international standards, as well as international certification of the plant creates an opportunity for Shirvan Wines LLC to gain credibility in global markets by its competitive products in a short time. On August 25, 2018, Azerbaijani President Ilham Aliyev and First Lady Mehriban Aliyeva attended the opening of a viticulture and wine-making complex of Shirvan Wines LLC as part of a trip to Shamakhi district.